Whether you're floating in the shallow end or swimming laps, a simple message goes a long way. 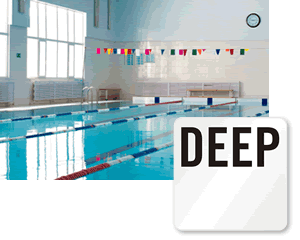 Use a range of water-resistant tile markers to mark areas around your pool. • Bright, bold signs are printed with black characters on a white background, for great visibility. • Adheres well to tile, desks, or concrete. • Tough, anti-skid vinyl features a pebbled, grip surface.